This week’s Nonviolence News is celebrating how Algeria and Sudan toppled their dictators amidst massive protests. In Sudan, “The Woman in White” captured worldwide media attention . . . but their movement isn’t over yet. Pro-democracy organizers are pushing for an immediate democratic transition rather than the military rule that is trying to ban protests and elections for two years. Stay tuned. We’ll update you on these unfolding stories next week. In this week’s news, you’ll find stories of victories and on-going actions for an amazing broad range of issues. Tech workers are organizing to halt AI ethics violations and rein in the surveillance state. Mongolian herders stopped a corporate behemoth from stealing their land. Gamers are upending industry conferences as they organize for a union. Stop & Shop grocery workers are on strike in the northeast United States. Student climate strikes and Extinction Rebellion are driving climate justice forward around the world. With this much happening, I was delighted to learn that the Dalai Lama proclaimed the 21st century the “Century of Nonviolence”. Is it any coincidence that two countries ousted their repressive leaders this week? I don’t think so. Nonviolence is literally changing our world . . . and at a much faster rate than anyone suspects (except maybe the Dalai Lama). Let’s prove his predictions and hopes true, shall we? You can help foment nonviolence by sharing the Nonviolence News e-newsletter with friends and posting it on social media. Here’s to the Century of Nonviolence! From Pam McAllister: On April 9, 1939, African-American Marian Anderson sang in front of 75,000 (with millions more listening on the radio) at the Lincoln Memorial, after the Daughters of the American Revolution told her she couldn’t sing at Constitution Hall because of her race. Thousands quit the DAR, including First Lady Eleanor Roosevelt. Anderson opened with “America.” From every mountainside, let freedom ring. Indeed! 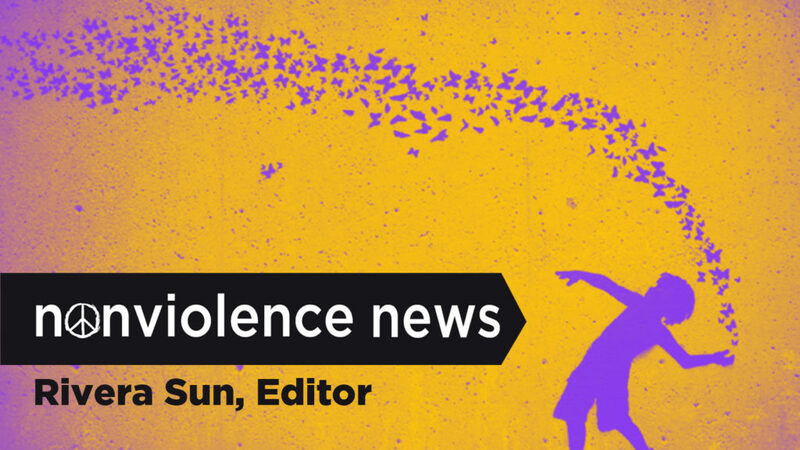 Nonviolence News is supported by generous readers and supporters! We appreciate your love. And your donations. Thank you. Here’s where to make a donation.